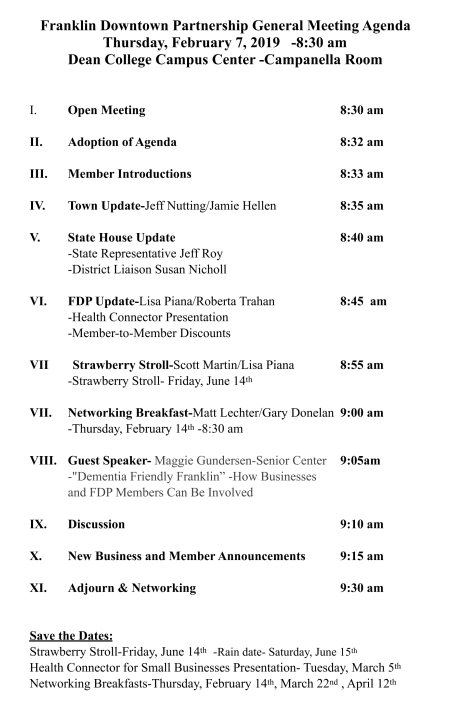 If you are a business owner or a building owner and you have never attended one of the Franklin Downtown Partnership's general meetings, we invite you to start the new year out by coming to our meeting on Thursday, Feb. 7 at 8:30 a.m. in the Campanella Board Room of the Dean College Campus Center. Meet our members, network with other business owners, and come hear all the updates in the town, state and with the Partnership. If you're concerned you don't have time, remember the meeting only lasts an hour, from 8:30 a.m. to 9:30 a.m. That hour will be well worth your investment of time if you meet a new client, a new customer, make a connection, or learn something new! And we have coffee! So join us - you don't know what you are missing! This month's guest speaker will be Maggie Gundersen of the Franklin Senior Center. She will give a brief presentation on "Dementia Friendly Franklin - How Businesses and FDP Members Can Be Involved." 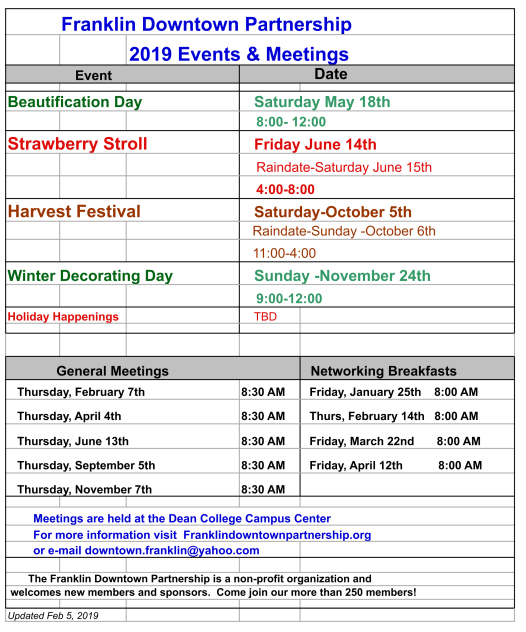 View the updated Franklin Downtown Partnership 2019 calendar. Please note the change in the date for the February Networking Breakfast. It has been rescheduled to Thursday, Feb. 14.